Alibaba’s logistics unit Cainiao Network and its overseas e-commerce platform AliExpress have signed a new strategic cooperation agreement with Spain’s national postal service Correos to boost cross-border logistics between China and Europe. Under the new agreement, Cainiao and Correos will help small and medium sized Spanish enterprises to accelerate parcel delivery within Europe for AliExpress, a company statement said. “With the fast logistics network built by Cainiao Network and Correos, AliExpress can bring high-quality goods from China and other countries to Spanish consumers in a shorter time,” Wang Mingqiang, general manager of AliExpress was quoted as saying. The cooperation agreement is also expected to boost exports of small and medium-sized Spanish enterprises on AliExpress. The agreement with Correos also includes new initiatives such as utilising residential buildings, offices and some 5,000 self-pick-up boxes across the country as delivery spots. Currently, parcels sent from China reach Spain in 10 days on average. Using big data to predict needs, Cainiao enables roughly 90% of sought-after items to reach popular destinations such as Madrid in three days. Cainiao Network has partnered with the national postal service of several countries, including China and Russia, as well as a number of international carriers such as Singapore Airlines and Emirates. 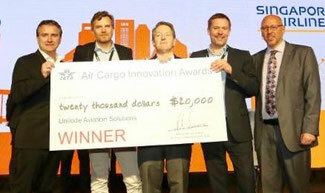 Unilode Aviation Solutions, the Swiss-based ULD management and repair specialists, were given IATA’s Air Cargo Innovation award for 2019 at a ceremony held at this year’s World Cargo Symposium (WCS) in Singapore. The award was given to Unilode in recognition of their Bluetooth-based tracking solution which they have developed for ULDs. The jury made up of air cargo industry experts evaluated a total of 56 companies who produce or develop various systems. Unilode was one of three shortlisted companies who presented their projects to a large audience at the WCS. The company also received a cheque for US$20,000 and the sum will be used to further develop the innovation. On Wednesday 27 March Dnata will officially inaugurate their Brussels premises in the refurbished former warehouse of Aviapartner. The okay for the Dubai based ground handler to offer airlines their cargo handling services at Brussel Airport was given by the airport management in October last year. 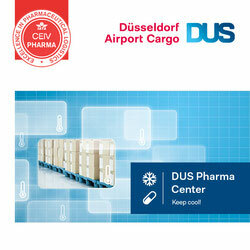 Dnata has direct airside ac-cess at Zaventem Airport. Up to now, the on-tarmac handling services were limited to two companies: Aviapartner and Swissport. Both had their licenses renewed. Even if Dnata is linked to Emirates Airlines, it is Singapore Airlines Cargo that has emerged as its launch customer in Brussels. The World Animal Protection (WAP) has claimed that earlier this year Turkish Airlines flew a large number of African grey parrots from Kinshasa to Kuwait via their Istanbul hub and that a total of 60 of the valuable birds were found dead upon arrival. Turkish Cargo which as an IATA listed carrier adheres to compliances of the Animal Transportation Association and which has committed itself to the IATA CEIV Live Animal Certification process, has in the meantime issued a total embargo on the carriage of grey parrots on any of their flights. It has not been stated as to what caused so many of the African grey parrots to perish, but possibly because of too many being packed together in crates too small to carry them. Turkish Cargo which is well known for its safe handling of animals is also working closely with World Animal Protection on future means to better safeguard animals transported by air. Atran Airlines, the Russian-based air express carrier which is part of the large Volga-Dnepr group of airlines, has received its first Boeing 737-800BCF freighter. The carrier now operates five B737 freighters and is the first to put the -800BCF series into operation. Atran operates services within Russia and on routes to the CIS and Europe. The first flight with the new aircraft was operated from Moscow to Norilsk and Yakutsk, carrying consumer goods, perishables and e-commerce shipments into the Siberian and Far Eastern regions in Russia. The B737-800BCF offers a far better payload than the standard B737 freighters and can accommodate 11 standard pallets on the main deck as well as containers in the belly holds. The Luxembourg-based all cargo operator, Cargolux has signed on a partnership with Sonoco Thermosafe, a company which provides temperature assurance packaging with their PharmaPort 360 temperature-controlled bulk shipping containers. The lease agreement will give Cargolux access to Sonoco’s state-of-the-art PharmaPort 360 containers for the carriage of temperature sensitive shipments throughout the carrier’s network. 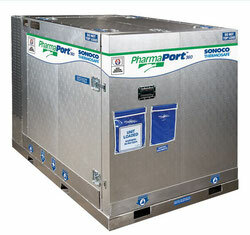 Sonoco states that their’s is the only active temperature-controlled container in the industry that includes a fully integrated FAA telemetry system. They state further that the PharmaPort enables the provision of real time cloud-based data on payload and ambient temperature and key mechanical components, precisely synchronized with a GPS location. Cargolux will use the new containers mainly for their expanding pharmaceutical product. easy state that the platform is simple to use where an individual request made on the portal is standardized and passed on automatically to the airlines listed in the system. The Franco-Dutch carrier is said to be the first to have adopted IATA’s newly introduced DG AutoCheck system. The new DG AutoCheck system allows users to better monitor and manage the transport of dangerous goods by offering a digital solution to control the acceptance of DGR shipments by giving users a reliable tracking of compliances needed on the DGR Shippers declarations and comparing them automatically with those laid out in the IATA DGR Regulations. The DG AutoCheck also enables handlers or carriers to decide whether to reject or accept a particular shipment during the physical inspection stage. 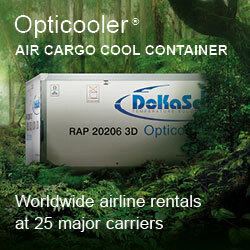 Almost 12% of the total AF-KL air cargo shipments carried each year are said to be of a DGR nature. Brussels Airport is the first European airport to sign up for The International Air Cargo Association’s (TIACA) Cargo Service Quality (CSQ) tool (CargoForwarder Global 10. March). What TIACA describes as an online rating tool, covers all aspects of air cargo processes including the physical and document handling, facilities, technology, general airport infrastructure and many more - they claim. David Bellon, Vice Chairman of Air Cargo Belgium and Airfreight Product Station Director at DHL Global Forwarding (Belgium) states that: “through CSG, the forwarder opinion counts. It is the voice of the customer and potentially a platform for discussion, which enhances the engagement of all stakeholders in the air cargo supply chain in Brussels to further improve set standards and be an example of the air cargo community of the future.” The TIACA CSQ was launched in February after a successful pilot scheme was completed involving 179 freight agents and 18 cargo terminal operators.